Your project manager bursts into the office, talking excitedly about an opportunity that has incredible potential for your organization. She drops a hefty stack of papers onto your desk and, right before walking out of the office, tells you that she knows you’re the right person for the task. You, my friend, must spec out a new display for that upcoming military project. 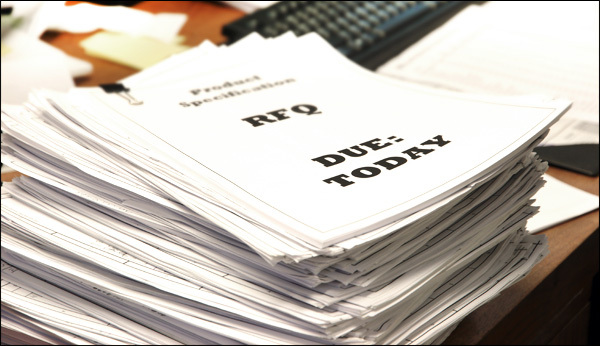 As you begin the unenviable task of reading through the pages and pages of requirements, you start to get the nagging feeling that you’ve been down this path before. Sunlight readable? High contrast ratio? Antireflective coatings? Yes, yes, and yes. Oh, and don’t forget: there’s a wide variety of MIL-STD-810, -461 or -901 requirements in the request for pricing, as well. You wince as you recall a similar design that was plagued with reflection issues, poor contrast, and failed to meet the harsh ESS requirements necessary for that particular application. Here’s the diagnosis: You are experiencing “Déjà Vue.” The widely accepted remedy for such an affliction is to find an improved solution to meet the rigorous requirements needed to land this new opportunity. You may have heard a lot about optical bonding, but is it the right solution for your application? Let’s closely examine the RFQ to determine if optical bonding may be a viable solution. 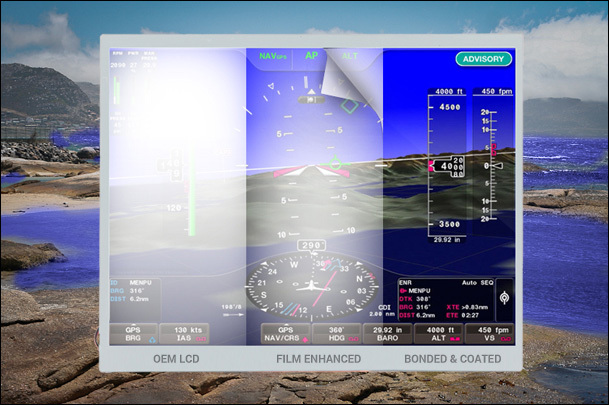 Do you need to increase luminance and contrast beyond what is available “off the rack?” Optically bonding an overlay to the display, using an index matched adhesive, can dramatically reduce internal reflections, thereby increasing the contrast and readability of the display in high ambient light or direct sunlight. Does the display need to meet severe harshness requirements? A bonded display assembly is typically able to withstand the high shock and vibration typically associated with MIL-STD-901, MIL-STD-810 and DO-160 requirements. Extended Operating and Storage Temperature Ranges. Will the display be required to operate in extreme temperatures? Through the use of an optically bonded display, coupled with an optical heater, temperatures down to –55° C are attainable. What exactly is Optical Bonding? Optical Bonding refers to the process of affixing two optical elements to one another using a liquid adhesive. The qualifier optical implies that the adhesive is transparent, has a suitable refractive index and is made under adequate control such that there are no significant variations in the optical properties within a single bond. In this way, we differentiate bonding from lamination. With more than 30 years in the industry, the silicone adhesive bond has been used for both commercial and military applications. As a relatively soft material, bonding with silicone involves minimal risk, as any problems with the bond can be easily reworked. Adding to its popularity as a bonding adhesive, silicone will meet a wide variety of display requirements; however, it does have some limitations when it comes to temperature and altitude. This bond is also best suited for bonding of glass overlays to the display. General Digital’s latest proprietary UV bonding process will take you where no other silicone bond has gone before! UV bonding technology allows for wider operating temperature ranges than traditional silicone bonds. Our formulation will survive a wide range of temperatures, well suited for today’s harsh environmental military applications. In addition, our UV technology solutions have tested successfully in simulated altitudes in excess of 55,000 feet, with no bond degradation to the assembly. UV bond technology provides for a thinner bond line (measured in microns, not millimeters) than traditional silicone bonds, which will integrate seamlessly with your current system, requiring no mechanical dimensional modifications to accommodate the added bond thickness. The UV bonded solution is also an excellent choice when optically bonded overlays (other than glass overlays) are required. We may not be doctors, but we’ve got the cure for what ails you! Whatever the application, General Digital’s Optical Bonding Laboratories Application Engineers will consult with you on a customized bond configuration best tailored to your specifications, and assist you in winning new opportunities. Call now for a no obligation consultation, or to learn more about our UV technology environmental testing results. Together, we can bring an end to Déjà Vue once and for all.